The Capital Asset Pricing Model is a mathematically simple estimate of the cost of equityCost of EquityCost of Equity is the rate of return a shareholder requires for investing in a business. The rate of return required is based on the level of risk associated with the investment, which is measured as the historical volatility of returns. Learn the cost of equity formula with examples and download the Excel calculator. CAPM states that investors require additional returns (risk premium) in excess of a risk-free asset proportional to market riskSystemic RiskSystemic risk can be defined as the risk associated with the collapse or failure of a company, industry, financial institution or an entire economy. It is the risk of a major failure of a financial system, whereby a crisis occurs when providers of capital lose trust in the users of capital. It is the required return demanded by shareholders of a risky asset. Equity Market Premium (EMP) is the excess of the expected return on the market portfolio compared to the risk-free rate. Beta (β) measures the level of risk of an asset relative to the risk of the overall market. If a stock is less risky than the market average, its β will be less than 1. If a stock is riskier than the market average, β will be greater than 1. There are no transactions costs. Investors can access all information and are equally informed. 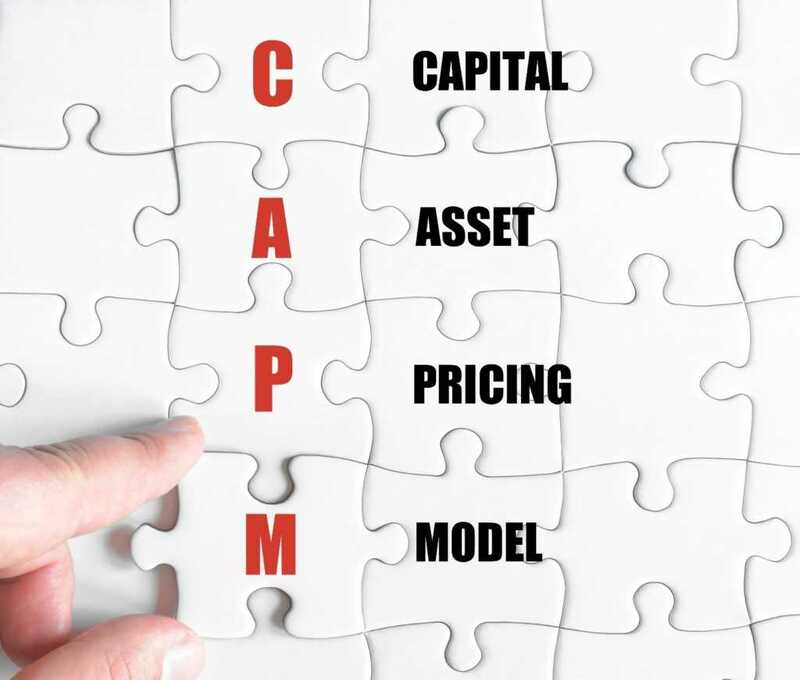 CAPM ignores any associated costs of diversification, and so investors will diversify until their portfolio contains all assets on the market. Therefore, all investors will diversify until they each hold the market portfolio. Every investor holds the same portfolio. The risk of an individual asset is the risk that the asset brings to the market portfolio. If the risk of the asset is firm-specific, the impact will be diversified away. However, if the asset moves with the market portfolio, it will add to the risk of the market portfolio. Covariance of an asset is the strength of related movement between an asset and the market. The risk of the market portfolio is measured as the variance in the returns on the market portfolio σ2m. The variance of the asset that is going to be added to the portfolio is σ2i. Covariance, σim, can be standardized by dividing it by the variance of the market portfolio. This equation gives us the asset beta; a relative measure of the risk of an asset in relation to the market. The covariance of the market portfolio with itself is its variance. 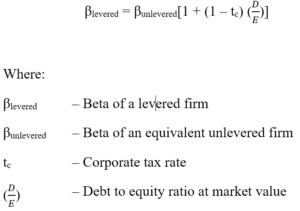 Based on the equation, we see that assets with a higher beta (more inherent risk) demand a higher expected return. The risk-free rate represents a theoretical rate of return with no variability (an asset beta of 0), meaning corporate bond rates are never used as a risk-free rate. The risk-free rate is commonly based on government bonds. While most government bonds are free from default risk, they are not totally risk-free. Government bonds are exposed to reinvestment risk as interest rates move after the interest rates on the bonds are fixed. For this reason, there is no true risk-free asset. Nevertheless, analysts commonly use the 10-year government bond yield as the risk-free rate in CAPM analysis. Use historical information to perform linear regression (historical market betas). Estimate the beta from company fundamentals (fundamental betas). Estimate the beta from accounting data (accounting betas). 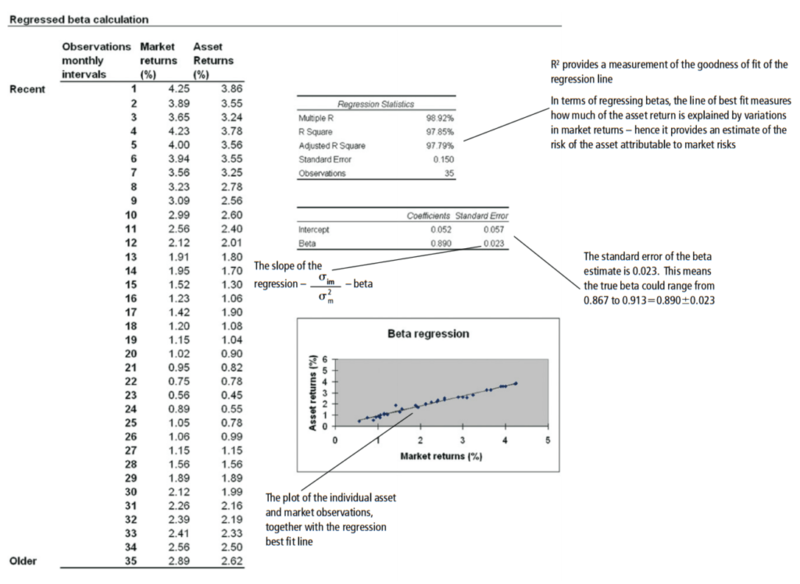 The regression of historic returns of an asset against the returns of the market is the standard method of producing beta estimates for firms that have been traded for a sufficiently long time. The estimated relationship between an asset return with the market is the foundation for beta. Common market indexes include FTSE 100 and S&P 500. Note that rearranging the CAPM equation as Ri = Rf (1-b) + βRm can be used to calculate an asset’s implied rate of return. Length of the estimation period (More observations may lead to bias in estimation). Frequency of the historic observations (More observations lead to a non-trading bias where a stock does not trade, leaving price static, but the market still moves). Market index used for regression (NYSE and the S&P 500 yield different yearly returns, these differences are apparent with more observations). The betas provided by Bloomberg and Barra are not identical to their different judgment for these considerations. However, betas are believed to revert to 1 over time, which implies that the risk of an individual project or firm equals market risk over the long run. Beta is difficult to estimate for private companies as their historical data is not readily available. These are indicators of an asset’s risk relative to the market. 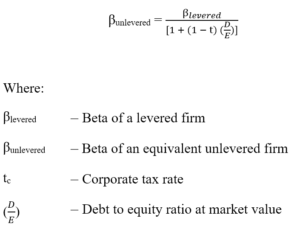 Bottom-up beta calculations use these factors to estimate betas from comparable information. Comparable betas are not sourced through tedious regression calculations. They are dynamic in the sense that any business-related changes are easily modeled. 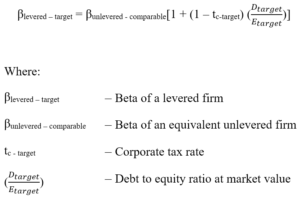 An accounting beta is estimated by comparing market performance against company earnings. However, calculating betas based on information that can be easily manipulated cannot yield a reliable beta. Beta measures how much the individual asset’s returns move in relation to the market portfolio and factors this into the required equity return. The CAPM needs to know the performance of a market portfolio in relation to the benchmark risk-free rate. This is given by [E(Rm) – Rf], CAPM takes this and quantifies the relative impact of the individual asset and hence an estimate of the required risk premium. The premium is estimated by analyzing the historic return on stocks over the historic return on a risk-free security. The difference between the two returns yields the historic risk premium. However, there can be wide deviations as there are differences in time length observed, the risk-free rate used, and the averaging technique used (arithmetic or geometric).